When Hurricane Matthew hit Haiti on 5 October, the fields where crops were grown were washed away; houses were flattened like cardboard boxes and hundreds of people were killed. The number of dead is now close to 1000 and cholera is once again a fatal danger on our shores. UNICEF says more than 600,000 children are threatened with food shortages. 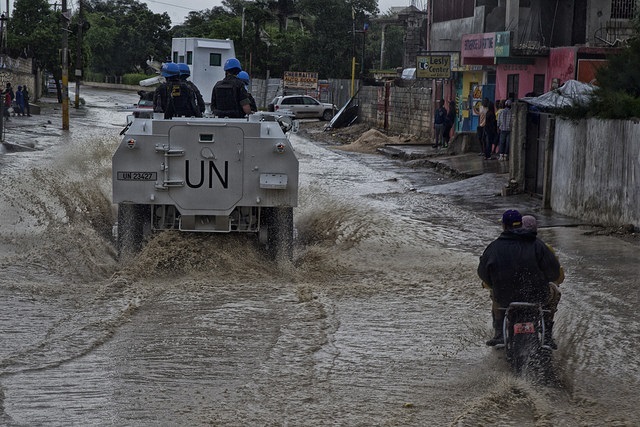 Aid is beginning to come in, often provoking violence among those who have felt abandoned after the second catastrophic natural disaster to hit Haiti in six years. The 2010 earthquake flattened the cities in the Port-au-Prince and several other towns and villages in the West and South Departments; the 2016 hurricane took care of the south west and the Grand-Anse. There is little left intact in Haiti. It’s hard to bounce back once, let alone twice. No one believes that rebuilding will be swift or smooth. Corruption always remains a risk in a country that consistently scores less than 20 out of 100, indicating rampant corruption and sits in the bottom 10 of Transparency International’s Corruption Perceptions Index. In 2014, the government introduced anti-corruption legislation but little has been done to implement it and at this critical time Haiti still lacks access to information legislations, strong whistleblower protection legislation and a law on financing of political parties. The much delayed presidential and legislative elections that were supposed to happen on the week the hurricane hit are now slated for 20 November. In spite of the many roads and polling stations that are destroyed, we remain cautiously optimistic that the elections will take place and thereby put an end to power vacuum at the top. Though, in the difficult, post-hurricane situation, elections may hold little interest for the people of Haiti, whose priority is survival. In our small way La Fondation Héritage pour Haïti (LFHH), Transparency International’s chapter in Haiti is trying to help by helping people prepare. 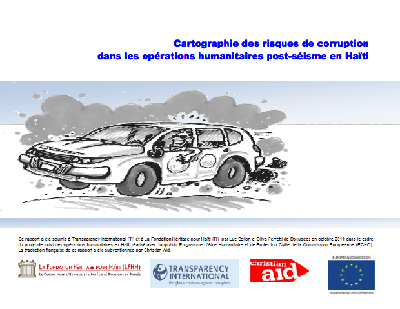 After the devastating earthquake of 12 January 2012, we developed a Haiti Corruption Risk Map and a Methodology for combating corruption in the delivery of humanitarian aid. Billions of dollars were pledged to help us rebuild from that catastrophe. This month the Risk Map and Methodology will be republished with the help of Christian Aid, within the framework of a post-hurricane project. All the problems that existed in 2010 are still there. For example, the threat of embezzlement of goods and funds. We are also worried that the surge in sexual harassment for supplies and jobs that marred the aid efforts in 2010 will happen again. There is a sense of lawlessness that needs to be stopped. A big cache of guns was seized in August. Perhaps they were imported just in time to disrupt the elections? The rule of law is constantly under threat. What we need now is strong leadership to give people a sense of hope amongst the debris. Without a government that is hard. So while we call on prospective leaders to set the moral tone during these difficult times, we will also work with grass roots civil society organisations by providing them with the tools and training to enable them to monitor the aid and reconstruction process. The survival of too many men, women and children depend on access to humanitarian aid. Corruption cannot be allowed to infiltrate the process! Haiti has had far too large a share of natural and man-made disasters that have opened the door to corruption and the corrupt and hurt the people, particularly the most vulnerable. As part of the global anti-corruption movement, LFHH is doing its best to remind the people that saying no to corruption and abiding by the rule of law not only helps more people survive catastrophes because aid is not siphoned off, but it strengthens the core of a country. That is the only hope for a better future. ← Why are three of the world’s richest countries doing so little to stop corruption?